Most experienced travelers have Costa Rica on their to-visit list. This Central American country has been a favorite destination for travelers and re-locators alike for over 20 years, and it’s not a big mystery why. 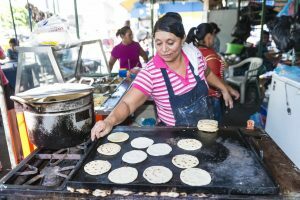 Not only is this small country filled with beaches, volcanoes, rainforests, and cloudy mountains, but it’s also the most developed country in Central America with the highest health and happiness rankings. Costa Rica combines a colorful, tropical culture with advanced modern development and technology. You’ll be able to experience the full charm and adventurism of the country while still enjoying modern lodging, access to dependable internet, and safe city walkways. Families, groups of spring breakers, and high school Spanish classes have been coming to Costa Rica for years, and they’ve had great experiences. Surprisingly, however, solo travelers have begun to rank Costa Rica as a top destination. Traveling alone always provides a memorable experience, but it can demand some extra planning. If you’re setting off on a lone adventure, go no further, Costa Rica is a tried-and-true destination for the solo traveler. You won’t only stay safe and entertained, but you may just be offered some opportunities that group-vacationers won’t have access to. 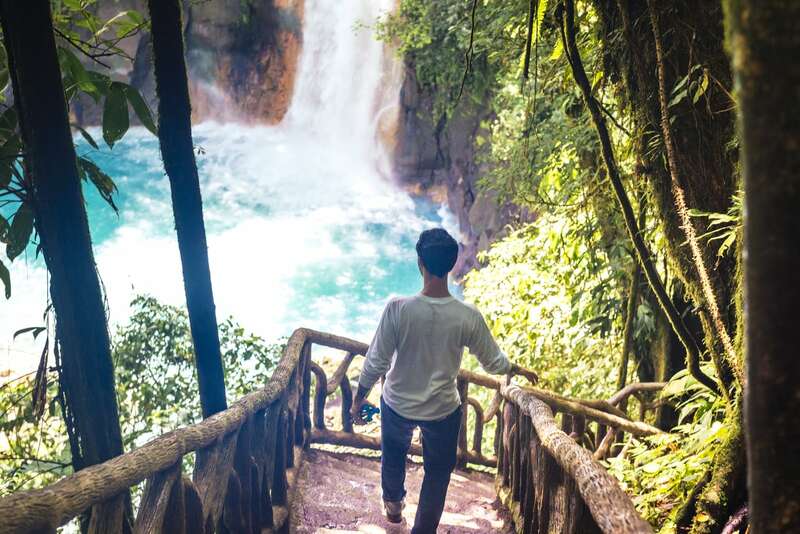 Rumor has it that Costa Rica is the birthplace of the phrase “adventure tourism.” This sort of tourism doesn’t focus purely on relaxation, but includes water sports, volcano climbing, intense hikes, and nature exploration. Costa Rica has 12 distinct microclimates and hosts over 4% of the entire world’s biodiversity, so adventure is a given for any traveler to the region. This incredible access to adventure has led to the opening of countless tour agencies and adventure travel guides. 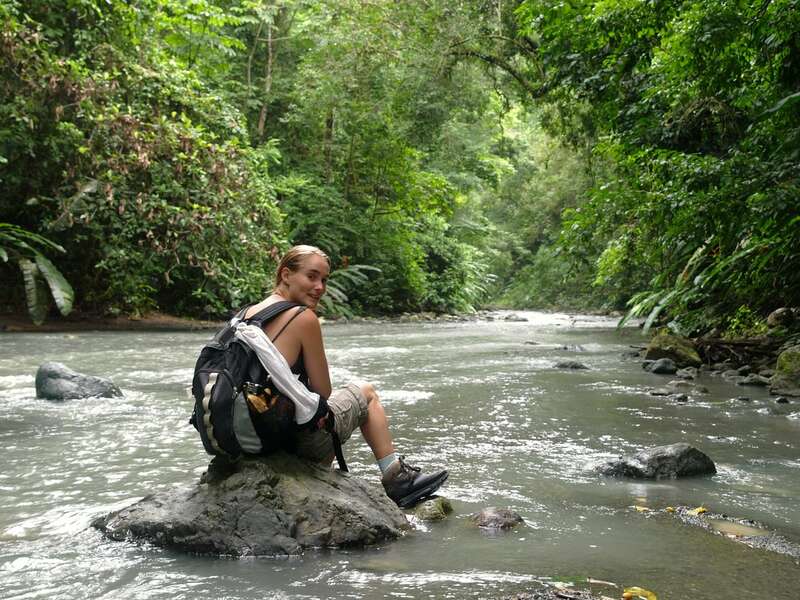 No matter where in Costa Rica you decide to visit, adventure will be waiting around the corner. When looking for adventure, the lone traveler has a head start. Tour operators will have daily excursions and groups of over 3 people will often need to make reservations well in advance. They will also need to pay extra for a private guide. The solo traveler, however, will almost never be turned down from a trip. Tour agencies will be able to squeeze one more person into whatever trip they have booked for the day, so your lack of a reservation will never be a problem. You’ll also save money by joining these larger groups. No matter where you find yourself, a daily excursion will have room for you. This also holds true for last minute hotel reservations or transportation rentals. During the busy season, those traveling in a group will need to make any reservations months ahead of time. The lone traveler, however, will be offered a bed in a dormitory or a room with a no-show reservation. 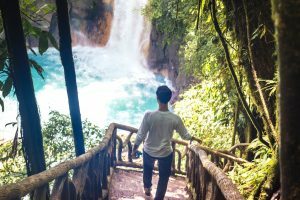 Typically, a solo traveler needs to do more preparation for a trip than groups of travelers, but in Costa Rica, you’ll be offered the gift of spontaneous travel. Often, large groups of travelers miss out on some of the more incredible aspects of the country. Off the beaten tourist trail, Costa Rica is the happy home to almost 5 million people. These people go to work, hang out with their friends, and go shopping every day. It will be too difficult to navigate a large family through crowded, unfamiliar territory, but the lone adventurer will fit right in. Without a large group, you’ll be able to visit local outdoor markets, find your way into concerts, and eat street food alongside the local lunchers. You won’t need to worry about counting heads or making everyone happy, you’ll be free to go where your feet take you and integrate into the colorful culture effortlessly. You’ll also be more approachable. While a vendor might feel rushed to keep a large group of tourists moving, you’ll be welcome to start up a conversation. You’ll learn more about your host country and the people, and might just get some underground tips that never hit the guide books. Safety is the main concern of the solo traveler. This is another reason why Costa Rica has become such a popular destination. Costa Rica is one of the safest countries on the American continents. It experiences a very low crime rate, with an ever lower violent crime rate. Pick-pocketing and petty crimes will be present in large cities, but even this can be avoided with some alertness and logic. Costa Rica has well-lit streets, trained law enforcement officers, and a welcoming culture. You’ll also have access to wifi in nearly any hotel, restaurant, or hang-out locale, so checking in with your at-home supporters will be a breeze. You’ll need to take the same precautions in Costa Rica as you would in your home countries. Walking alone late at night or traveling with large amounts of cash is never advisable. If you follow logical travel rules, you can count on an exciting and crime-free vacation. Costa Rican locals have a reputation for being friendly and helpful. 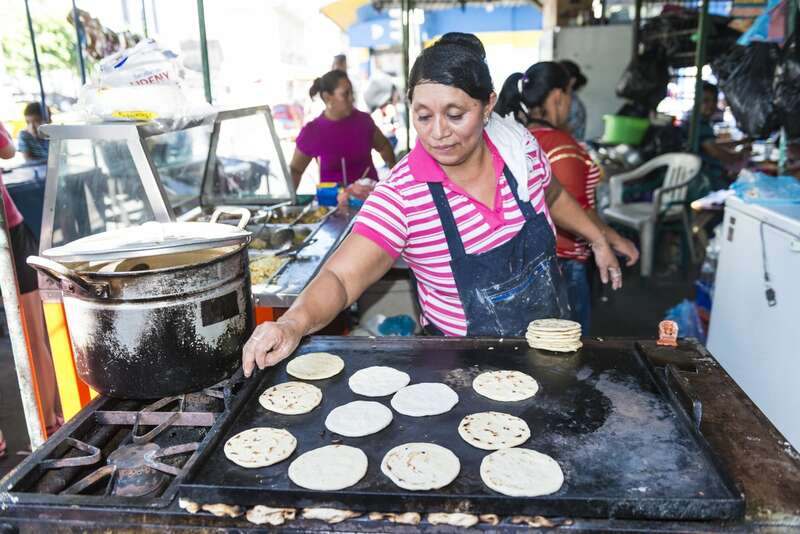 Market vendors won’t try to sell you products at increased prices, and a stranger on the street will be happy enough to point you in the right direction. This can mean a lot to the lone traveler. You will doubtlessly lose your way during your trip, but rest assured that the average Costa Rican will be quick and generous with advice. When shopping in outdoor markets in Costa Rica, you typically will not find bartering to be acceptable. This doesn’t tend to be a problem, however, as it is not a Costa Rican vendor’s custom to swindle money from tourists. You’ll be offered the same prices as everyone else and be given the same quality of product. You’ll find yourself always accompanied by helpful, happy people. Solo traveling has become more and more popular in recent years, and Costa Rica has proven to be a favorite destination. This means that you’ll find people at every stop with a similar plan as your own. If you want a travel buddy for the day, you’ll always find one. You’ll be able to swap stories, give advice, share taxis, and have dinner every day with a new and increasingly interesting traveler. For those traveling solo with the intention of making friends on the road, there are certain steps you can take to ensure your success. First of all, stay in travelers’ hostels. These hostels range from communal dormitories to well-furnished, air-conditioned private rooms, so you won’t be sacrificing comfort. You will, however, find a lodging situation more suited to communities. Most hostels will have a large common area with hammocks, rocking chairs, music, and beverages. You’ll find many lone travelers anxious to meet a buddy for the day. This is the best way to find lunch friends or tour groups to join. You can also spend your free time in well-known coffee shops and bars. The receptionist at your hostel will have all the tips you’ll need. Here, you’ll be able to strike up conversations with like-minded travelers. Sometimes these conversations will lead to great destination tips, and sometimes they’ll be accompanied with an invitation to join. Regardless of whether you’re a lone wolf or a party animal, solo traveling in Costa Rica will be the experience of a lifetime. You’ll find interesting people from all over the world offering tips, and may just earn some opportunities that large groups of tourists would never find in their guide books.